Marble and bronze sculptures relating to the Brownings and Dr. A.J. Armstrong can be found throughout the library. This life-sized bust was done in 1841, when John Kenyon was 57 years old; it eventually belonged to the Brownings. A distant cousin of Elizabeth Barrett and a close friend of Robert Browning, Kenyon was responsible for the two poets' meeting. Elizabeth Barrett had mentioned Browning very favorably in her poem "Lady Geraldine's Courtship." Kenyon gave a copy to Robert and encouraged him to thank her--this began a correspondence that led to their courtship and marriage. Kenyon was very close to the couple, helping them financially during his lifetime and leaving them a generous sum of money in his will. The bust was given to the Browning Collection in 1944 by the Neiman-Marcus Company of Dallas, Texas. Commissioned by Robert Browning for his wife Elizabeth, the bust of their son, Robert Wiedeman Barrett Browning, was modeled in 1858 for a fee of 25 guineas which was a considerable sum of money at the time. Although Pen was nine years old, he was still dressed in a fashion more suitable for a Victorian boy of four or five. Elizabeth wanted him raised in an androgynous manner, hence the bust's long curls and feminine mode of dress. Robert did not agree with this idea. Following Elizabeth's death in 1861, Browning had Pen's hair cut and dressed him in a young man's clothing. The bust was a gift in 1922 from the Highland Park Browning Club, Dallas, Texas. Marble reproduction of William Wetmore Story's original 1861 bust. Browning is depicted as he was shortly before Elizabeth's death in June of that same year. The original terra cotta bust is in Casa Guidi, the Browning's apartment in Florence. Prior to 1989, the original was housed in the Keats-Shelley Museum in Rome. During his visit to Italy in 1930, Dr. Armstrong obtained permission from museum authorities to have a reproduction cast of the Robert Browning bust as well as the companion bust of Elizabeth Barrett Browning. The reproduction was the gift of Sigma Tau Delta, an honorary English society at Baylor University. 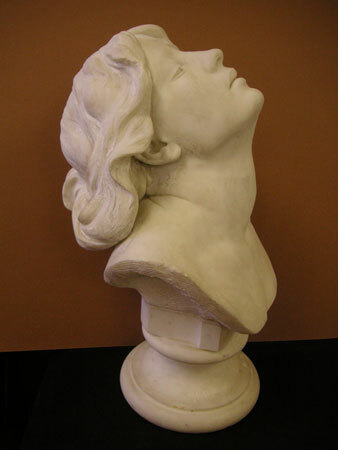 Marble reproduction of a bust made after Elizabeth's death by William Wetmore Story. The bust was a gift from the Peer Club (a former Baylor girls' social club) and was presented to the university in 1944. While visiting Italy in the summer of 1930, Dr. Armstrong obtained permission from authorities at the Keats-Shelley Museum in Rome to have reproductions made of this bust and the companion bust of Robert Browning. The original terra cotta bust done by William Wetmore Story, ca. 1864, has been on display in the Brownings' apartment, Casa Guidi in Florence, since December of 1989. A-tiptoe for the blessing of embrace . . . . This piece was exhibited at the Paris Universal Exhibition of 1889, but all trace of it was lost after 1951. Thanks to ABL's Assistant to the Curators Melvin Schuetz, the bust was re-discovered in a private home in Georgia and added to the ABL collection in 2010. At this point in time, it is the only example of Pen's sculpture owned by the Armstrong Browning Library. The artist was inspired by the line "O lyric love, half angel and half bird," the first line of Robert Browning's invocation in Book I of The Ring and the Book, lines dedicated to Elizabeth Barrett Browning. The statue, which was presented to the Library in 1959 by the widow of the artist, stands atop a mahogany pedestal 18" tall. The New York artist, John Gregory (1879-1958), also executed bas-relief panels depicting scenes from nine of Shakespeare's plays for the north facade of the Folger Shakespeare Library in Washington, DC. Percy Bysshe Shelley (1792 - 1822) was the first important influence in Robert Browning's literary life. Browning's friend, Thomas Carlyle, gave him the original Shelley bust, which had been created from memory by Marianne Hunt, wife of Leigh Hunt, in 1836. The original plaster bust is now at Eton College in England. This copy, also in plaster, was commissioned by Eton during the bombing raids of World War II. In 1983, at the suggestion of Michael Meredith, former House Master and retired Librarian, Eton's Provost and Fellows decided to donate the copy to the Armstrong Browning Library. This bust portrays Dante Alighieri, best known for his Divine Comedy. It was a gift from Mrs. Mary Sendon of Waco, Texas, and was presented to the Armstrong Browning Library in 1998 in memory of Dr. A. J. Armstrong. The hammered bronze bas-relief medallion given by Mrs. Phil Teeling of Waco, Texas, in 1971, has a pecan wood frame and hangs near a fine white carrara marble bust of Dante. The bust, unveiled in 1921 during a ceremony commemorating the six-hundreth anniversary of the death of Dante, was the gift of Joseph P. Todaro of Temple, Texas—a native of Sicily. He financed the Dante celebration held on the Baylor campus as a tribute to Dr. Armstrong, who had aided him in his study of the English language. 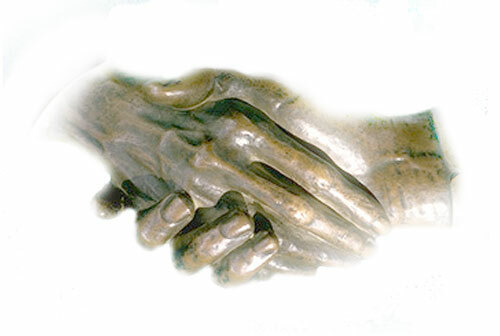 Encased atop a marble pedestal in the Cloister of the Clasped Hands is a bronze cast of the poets' clasped hands, which was made in 1853 by their American sculptor-friend Harriet Hosmer. The bronze, presented to Baylor on June 14, 1920, during celebrations commemorating its seventy-fifth year, was passed from Harriet Hosmer to Kate Field, a literary writer for the Atlantic Monthly. After her death, the piece was left to Lilian Whiting, a well-known Browning authority, who presented the hands to Baylor. Close examination of the cast provides an insight into the physical size of the Brownings, especially Elizabeth's fragile health. Profile in bronze by Thomas Woolner, a young British artist of the pre-Raphaelite Brotherhood. Woolner had sculpted a medallion of Alfred Tennyson which Browning admired so much that he decided to have one made of himself. The artist presented the medallion to W. M. Rossetti, and it was procured from his daughter by Dr. Armstrong in 1935. May Smith Dean was a member of the Boston Browning Society. This green bronze bust was commissioned by the Literature Survey Class of Waco, a group of 100 women organized in 1926 who met once a week for nearly twenty-five years to hear lectures by Dr. Armstrong. The bust was presented on October 23, 1935, in the Browning Room of the Carroll Library and was transferred to the Armstrong Browning Library following the building's opening in 1951. Would you have your songs endure? Build on the human heart! The statue was commissioned by the Tuesday Club of Brady, Texas, and by Mr. & Mrs. John Leddy-Jones of Dallas. It was presented to the Library on November 1, 1957. Portrayed is the character of Pippa from Robert Browning's poem Pippa Passes. 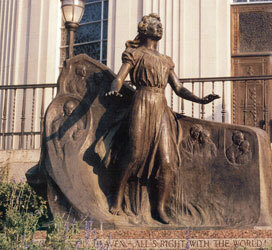 She is shown in full-length bas-relief, facing the viewer. The plaque was a gift to the Armstrong Browning Library from the New York Browning Society and was dedicated in 1950. The plaque depicts a bas-relief bust in profile of Dr. Armstrong, who was head of the English Department at Baylor University and the founder of the Browning Collection. An excerpt from Robert Browning's Epilogue to Asolando appears as a tribute to Armstrong.